No photo today. 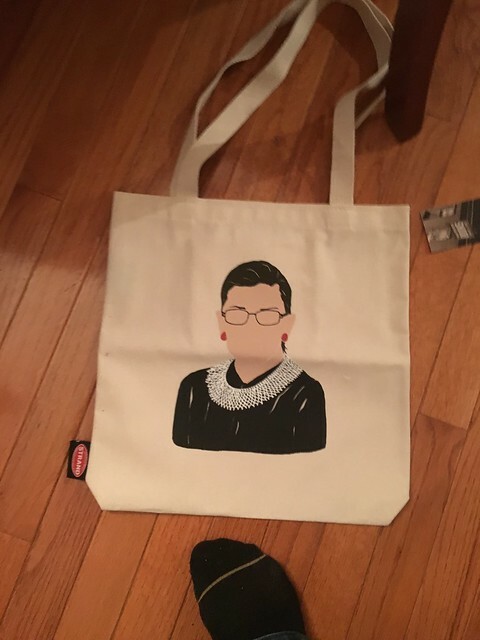 Just a bag with Ruth Bader Ginsburg. I did my 2nd shift at the hospital yesterday. Even though the hospital is five minutes from the house, there is a huge difference in my efficiency when I'm away from the house working for 12.5 hours compared to working at home for 8 hours. That's 4.5 hours a day that I stuff a lot of crap into - I can usually get a workout, cook/prep dinner, follow up on insurance/bills, laundry, helping Vince/Edda out, studying for nursing school. I still persist in my desire to get all the stuff done even though it's really not possible. Yesterday, outside of the shiftwork, I still wanted to: get a run in, do a load of laundry, get an hour of work done, review math with Vince, wash the dishes, pay bills and study for a test I have in a few hours. I did get a run in and I did pay a bill (which I owed the hospital and I paid in person, I'm not sure that counts) and that's it. I wanted to be asleep by 8:45 pm. I WANT A BAG LIKE THAT ONE!!!!!!!!! Where did you get it?